He was recently linked to a possible move to Fernando Alonso’s planned WorldTour team – which was itself reported to be considering buying the licence held by the Cannondale squad – but it appears that Peter Sagan could become the subject of a bidding war with Tinkoff Saxo. According to Tuttobiciweb, the team’s owner Oleg Tinkov is keen to sign the Slovakian sprinter and Classic specialist, and is prepared to improve on the annual salary of 3.3 million euros said to be on offer from Alonso. The Italian publication reports that Tinkov is willing to pay approximately four million euros per season. If so, it’s an offer that other teams will likely struggle to match. 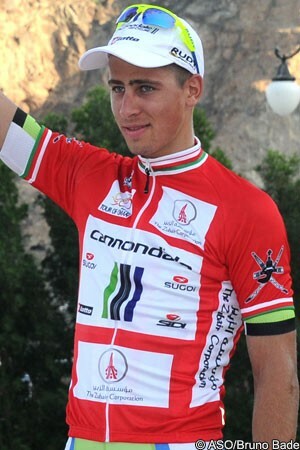 Still only 24 years of age, Sagan has won numerous races and taken two green jerseys in the Tour de France. His results also include four Tour stages, three in the Vuelta a España, the Tour de Pologne, the Giro di Sardegna, Gent-Wevelgem, Brabantse Pijl and the GP Cycliste de Montréal. He also clocked up stage wins in a large number of events including the Tour of California, the USA Pro Challenge and the Tour de Suisse. His rate of progress plus his young age have led to predictions that he could dominate the sport. In fact, former world number one and 1988 Vuelta a España winner Sean Kelly has even suggested that Sagan could become a Grand Tour contender if he slims down. While Tinkoff Saxo has Alberto Contador as its number one rider for stage races, Tinkov has made clear that he wants his team to be the best in the world. Sagan is consequently understood to be of interest to him. Both Tinkov and Alonso are yet to react to the report. Official deals cannot be completed until later in the season but if Sagan has a strong Classics campaign and Tour de France, he will only increase his attraction to teams looking for big names.